In Calabria, eggplant is stuffed with different kinds of filling and cooked in different ways. If you're serving it as an appetizer or side dish, you would use a simple filling. But a hearty filling, like the recipe below that we prepared in my last class, makes a substantial main dish. Most cooks fry or blanch the eggplant shells before stuffing them, baking the filled shells for only about 20 minutes. Because this recipe uses a filling with raw meat, and therefore requires a longer cooking time, it's not necessary to cook the shells before stuffing them. I typically use the small Italian eggplant variety when I make this recipe, but very small Globe variety eggplant will work as well. 1. Cut the eggplants in half lengthwise. Remove the pulp, leaving the shell about a quarter inch thick. Be careful not to tear the sides or bottom. Chop the eggplant pulp finely and set aside. 2. Heat the olive oil in a skillet over medium heat. When the oil is hot, add the chopped eggplant pulp, garlic and parsley. Sauté for a few minutes until the eggplant pulp is tender. 3. 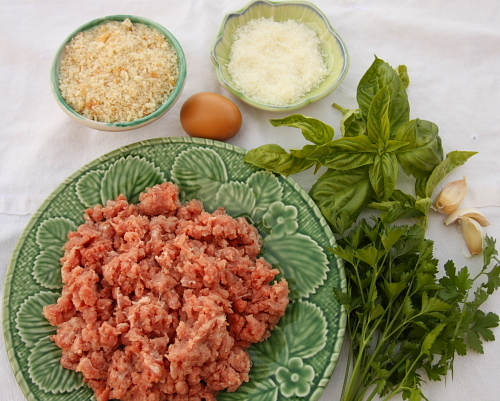 Remove from the heat and add the ground pork, breadcrumbs, basil, pecorino cheese, and egg. Add the water and mix all gently by hand. Add the teaspoon of salt and season with pepper to taste. 5. Lightly salt the eggplant shells and fill them with the stuffing. Spoon a layer of tomato sauce in a baking dish and place the stuffed eggplants alongside each other on top of the sauce. Spoon a little more tomato sauce over the eggplant and sprinkle with pecorino cheese. 6. Loosely cover the baking dish with foil, and bake for 45 minutes. Remove the foil and bake for an additional 15 minutes. The eggplant can be served hot or at room temperature. Use a dense, day-old Italian or French loaf. Do not remove the crusts. Cut the bread into 1-inch cubes and process them in a blender, filling it no more than halfway, until they are as fine as possible. You can freeze the leftover breadcrumbs for future use. ... and let me know what you think! This recipe, as is prepared in the town of Maiori, near Amalfi, is a slight variation from the one more widely found, in that it contains ricotta in the filling. To make the original version, omit the ricotta and egg from the filling and refrigerate to set, without baking. Just serve, accompanied with a small glass of iced limoncello. 1. In a large, shallow dish, mix the cup of sugar, cinnamon and lemon peel and set aside. 2. Peel and thinly slice the eggplants lengthwise, about ¼ inch thick. Heat enough olive oil in a 10-inch skillet to come 1/2 inch up the sides of the pan. 3. Lightly coat the eggplant slices in flour and fry until golden on both sides. Remove and place on a platter lined with paper towels. Continue frying until all the eggplant slices have been cooked. 4. While still warm, dip each slice of eggplant in the flavored sugar and press to coat both sides. Set aside until ready to assemble. 5. Make the chocolate sauce (see attached recipe). 6. In a bowl, combine the ricotta, ¼ cup sugar, amaretti cookies, chopped almonds and candied orange peel in a bowl. Blend in the eggs and set aside. 7. To Assemble: Preheat the oven to 375 degrees F. Butter a baking dish (9 x 9 x 2 inches) and coat with granulated sugar. Line the bottom and sides of the baking dish with slices of eggplant, arranging them so there are eggplant slices draping over the sides of the dish. Spread one third of the ricotta filling over the eggplant, and top the ricotta filling with a light layer of chocolate sauce. Without draping any eggplant over the sides this time, repeat the layering of eggplant, ricotta filling and chocolate sauce two more times, so you have three layers of each. Finish the dessert by topping with a fourth, and final layer of eggplant and fold the eggplant draped over the sides of the dish back over the dessert to close it like a package. 8. Place in the oven and bake for 20 minutes, placing a cookie sheet underneath the baking dish to catch any sugar syrup that bubbles over. Remove the baking dish from the oven and allow it to cool. When the dessert has cooled, it can be sliced and served with additional chocolate sauce or powdered sugar. This dessert can also be made using individual ramekins following the same layering process as described above, spreading the ricotta filling to about ¼ inch thick. Turn the dessert out of the ramekin before serving. And here is the recipe for the chocolate sauce. 1. Place the chopped chocolate in a small bowl. 2. Place the heavy whipping cream in a small pot and bring it just to a boil. Remove from the heat and pour the hot cream over the chopped chocolate. Let set for two minutes without stirring, then gently stir until the chocolate is melted and smooth. Let the sauce cool until it reaches the desired thickness and consistency. Growing up in Calabria spoils you for eggplant. The soil and hot weather are ideal there for it, but luckily we have similar weather here in California and I can grow them in my garden. After tomatoes, eggplant takes the top spot in vegetables in Calabria, and there are hundreds of ways of fixing it. I could probably write an entire cookbook on it. My favorite snack as a little girl during the winter was preserved eggplant, or melanzane sott'olio: sliced, cooked with vinegar, dried out for a day and then packed in jars with garlic, hot peppers, wild fennel and olive oil. It is still one of my favorite vegetables. You can buy seeds from GrowItalian of the "Violetta Lunga" and "Gitana" varieties, which are like the eggplant found in Calabrian gardens; I plant these because they are hard to find in the farmers' markets. And the two varieties I usually buy are the "black beauty" or "globe" type, and the Filipino type. The picture below shows all three varieties. The Filipino is the light greenish purple one. 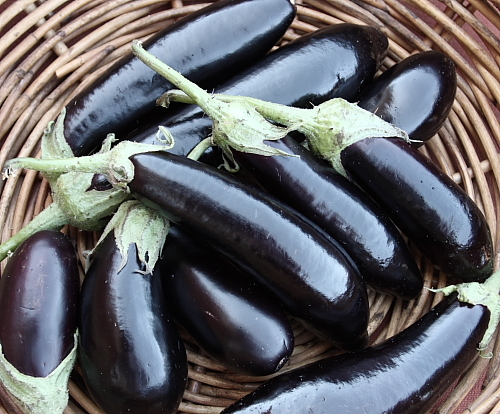 When you buy eggplant, look for firm, heavy ones free from blemishes, with a uniformly dark, rich purple color. The skin should be taut and shiny, not wrinkled or flabby. The fuzzy caps and stems should be green. As eggplant mature on the vine they develop seeds and their shiny deep purple color starts to fade. Eggplant are best eaten the day they are picked, but if you keep them, make sure it's only for a couple of days, and keep them in a cool but not cold area; they go bad quickly in a refrigerator. If you notice black seeds inside the eggplant when you cut it open, throw it away; it has been sitting around too long and will be bitter. Eggplant are naturally sweet when fresh, and do not need to be salted for a long time to remove bitterness. I typically salt and brush the slices with oil and immediately grill or bake them. The only time to keep eggplant under salt would be if you are frying it; then the salt will prevent too much oil being absorbed. One of my students once dared me to teach a whole class using only eggplant. So, I created a menu using only eggplant from appetizer to dessert, and it was such a hit that I have been repeating the class every year during the month of August. I vary the menu for every class--except the dessert! Polpette di melanzane (eggplant fritters) for the appetizer. Involtini di melanzane con ripieno di pasta (eggplant rolls filled with spaghetti, caciocavallo cheese and topped with tomato sauce and ricotta affumicata or smoked ricotta) for the first course. Melanzane ripiene(eggplant stuffed and baked with ground pork, breadcrumbs and pecorino cheese) for the second course. Insalata di melanzane(strips of cooked eggplant tossed with olive oil, garlic, peperoncino, mint and vinegar) as a salad. Melanzane al cioccolato(eggplant layered and filled with ricotta and chocolate) for dessert. Eggplant in a dessert?! Yep! It is not a Calabrian dish, but comes from the Amalfi area of Campania, and its ingredients vary from town to town. I created my own version similar to the one from the town of Maiori. It's kind of like the dessert version of eggplant parmigiana, with sweet ricotta substituting for the cheese and chocolate sauce in place of the tomato sauce. This dish is always the piece de resistance in the class. The only way you can believe that you're eating eggplant is if you make it yourself. 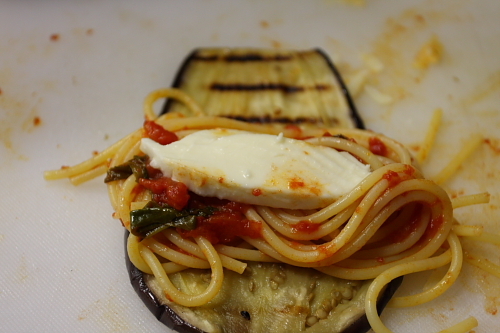 For the rest of the month of August I will share three eggplant recipes from the class. And since I know you can't wait to try it, I will start with the steps of how to make this unique and delicious dessert. To whet your appetite, see below! Since my last garden update in June a lot has happened in my garden. I have enjoyed fresh strawberries, zucchini, cucumbers, romano beans and baby lettuce every day, and lots of wonderful figs. We have a small patch of strawberries that provide us with the best fruit all summer long; we manage to pick a basket every other day! Look how wonderful they are below, fully ripe and sweet and juicy. Note the shape and size carefully so that you can buy strawberries that look just like them at a farmers' market. Whatever you do, don't buy those giant, perfectly shaped strawberries. 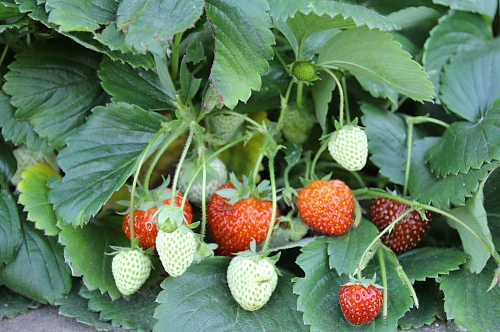 July is also the month when we start harvesting and preserving some of the garden bounty. We picked our sweet Italian red onions (cipolle di Tropea) and as you see from the picture below we braid them and hang them from my apple tree, which is how we always kept onions in Calabria. This way, they stay in the shade and don't sprout. Not that I have to worry about their sprouting--they don't last past the summer months, because they make for great eating. 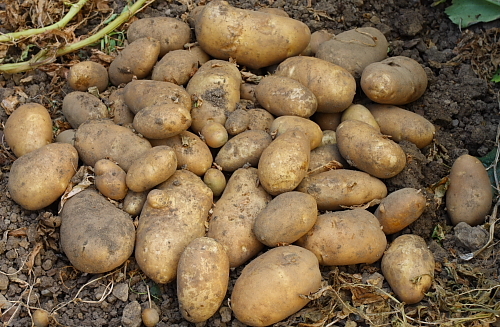 My 14-year-old son harvested his potato patch and was very proud of the results; from just a few cuttings he managed to pick 15 pounds. He has just planted another crop, this time of Yukon gold, to see if he can produce two crops in one year. I will let you know how his experiment turns out. We also harvested my oregano patch. Right after it is in full flower we cut it down to the base. We tie the long stems in bunches with kitchen string and hang the bunches upside down to let it dry in a shady spot in the garden. This is the oregano that I'll use for the rest of the year for dishes that require it dried. But I always keep a small patch of fresh oregano in the yard; luckily here in California I am able to have fresh herbs all year round. I also harvested lots of basil and made my first batch of pesto. I freeze it and put it away for the winter months. The tomatoes are growing up their trellis. They are almost at the top of the poles and all the branches are loaded with tomatoes. In about a month I will have the juiciest, sweetest tomatoes. 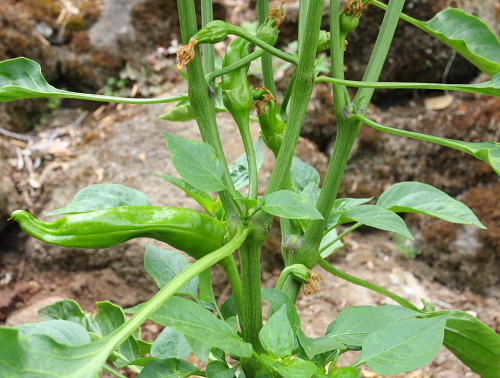 ...as well as the sweet Italian peppers. For the next update I will have a garden full of eggplants, tomatoes, romano beans, and hot and sweet peppers. August and September are the best time of year, loaded as they are with all my favorite vegetables.